I have a big problem in my training life. It comes in several flavors, but it all comes down to the same problem. I don't have enough time, energy or money to do all the routines I have been exposed to over my sports and martial arts life, dating back to the first time I lifted weights for Crew in 1972. But the flavors really do matter, so before I lay out what I am doing to solve this problem, and it is easy and cheap, let me explore the flavors. Only 30 Minutes - Really! 1) I have been lifting weights to: Gain weight, lose weight, gain strength, define body, prevent injury, increase endurance and more all of my life since age 13. I have NEVER gotten the same message from any two coaches or doctors. Ever. So it is hard to decide what to do from a book or coaches, since they are all different. Experience is the only way, and to do that, you need to DO IT. 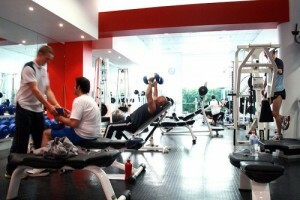 2) I have bought gym memberships, weight machines, free weights .. bought them all. Lost or buried them all too. Doing it is what matters, not doing it with a certain piece of equipment. Plus, money does not grow on trees. True, it is made from paper, and cloth, but if you grow your own money, you can weight lift for a decade or two under the protection of the federal government in jail. So I created a routine that uses only resistance bands and my own body weight. Pretty cheap, and easy to carry in my bag. 3) I need paper, computer, and/or TV to remember what I am supposed to do next, and how to do it, since from day one, every coach has told me to do it right, and do it slowly. Some add do it to failure, since more strength seems to be the desired end. (Unless you are a martial artist, then what you want is fast strength, not bulk strength - plus there is the weight class thing, and if you have been doing it long enough, the old stand by of "muscle weighs less than fat" argument only works so far. Then you get bigger and fight bigger.) So I use very few traditional routines, since I would have to remember their names. I designed a routine that takes from 30 to 40 minutes a day, and used Martial Arts techniques. Those I will not forget. Here is my Upper Body Resistance Workout #1 designed for Me and Martial Artists that just want to do it. Techniques: You need to know an Up Block, In Block, Out Block, Down Block, Reverse Punch, Back Fist, Ridge Hand, Knife Hand, Bicep Curl. Equipment: You need a double handle resistance band from absolutely any manufacturer. I bought a complete set, because it was cheaper. ("Why resistance bands," you ask. Most techniques that are dynamic in the martial arts will separate the active joints and connecting tissues if done with weights attached to or held in the hand. I know this because as I got each joint repaired, my orthopedic doctor reminded me how foolish it was to ignore momentum and physics.) Feel free to use dumb bells for the curls and/or the optional wrist exercise, but they weight more, and not having your equipment with you when you want to work out is just another excuse to not work out. All of these exercises are done 3 times, or 3 times a side, alternating from one side to the other. I do about 30 seconds, or max 20 reps as fast as I can. Usually, if I have the resistance high enough, I do 20 reps the first time and 6 - 8 reps the last time, but that is up to you. I don't believe in goal setting, as most leaders are not goal setters, they are problem solvers, so recording what I do does not really matter. Doing it matters, and the results matter. 1) Bicep Curl - Thing to remember - do you remember when you first trained in the martial arts, you were told that a good system or art had no wasted motion. That is true here too. When you are doing curls with one arm, the other you keep under tension so you do not waste the time or the motion of that arm while working the other. How much tension is up to you. On the arm doing the curl, once you start, you do not ever completely relax the tension. I do full range of motion curls, but you do what you want to do. 2) Reverse Punch: This is done from a fighting stance or a ready stance, with the punching arm starting and returning to the guard position by your face. Just like you have done your entire martial arts career. You punch straight out and rotate your fist at the "point of impact" and return to the guard position. The Resistance band is wrapped around your back and secured so that there is slight tension in the punching hand when in guard position. To increase difficulty, either increase the starting position tension, or increase the resistance of the band. This is done from a fighting stance or a ready stance, with the punching arm starting and returning to the guard position by your face. Resistance band is behind you. You punch straight up, with the resistance band starting with light tension on it while in guard stance. At the top of the punch, you rotate (twist) your fits to the outside of you body at or near the end of the punch. As before, to increase difficulty, increase starting tension or the tension of the band itself. 4) Up Block (High Block): Again, starting in the Guard stance with your hand in front, stepping on the Resistance Band with the foot on the same side as the arm you are blocking with, to the outside of your foot. I know many different high blocks, as I am sure you do. This one is done anyway you want. The one in the illustration is done by punching across your face and up, using your bicep to move the fist upward, then rotating the hand holding the handle as a knife, and rotating your fist upward as if you are stabbing upward with the bottom of your fist holding the handle. The picture shows the fist 1/2 way through the rotation. 5) In Block (from the outside, across the inside): Again, you start in a guard stance, standing on the resistance band with the foot on the same side as you are blocking with. The band should be under tension as before, though light tension is all you need. You perform the in block as if you are stabbing with the handle across your body from the outside where you started, to the inside. Rotate the fist sharply inward at impact, before you return to guard stance. With this block, it is better to increase difficulty by changing bands, as the tension Downward is the enemy to proper performance of the block. 6) Out Block : Again, you start in a guard stance, standing on the resistance band with the foot on the same side as you are blocking with. The band should be under tension as before, though light tension is all you need. Grip the handle as before, as if it were a knife. 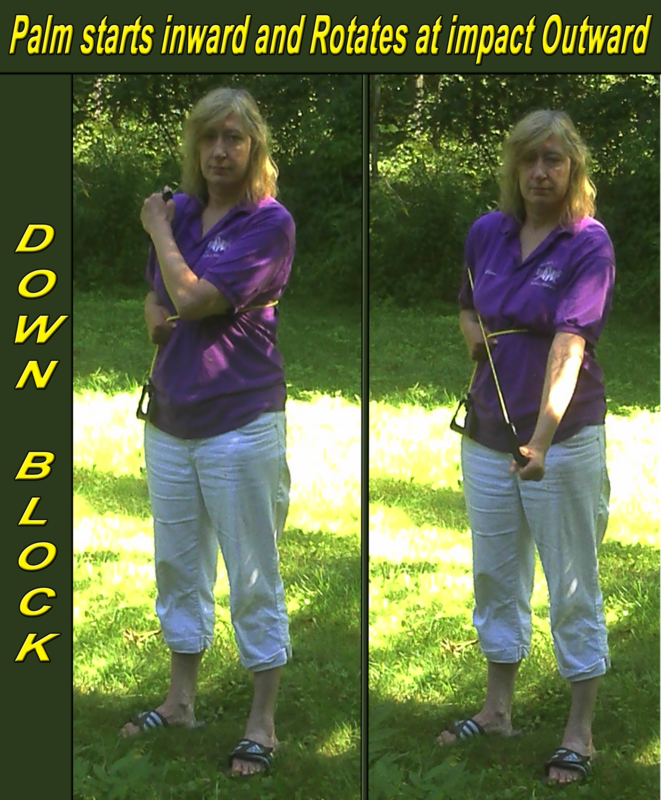 You perform this block opening your shoulder as shown in the picture and blocking to the outside of your body, fist still face high. At the point of impact, you rotate your fist as far outward as you can. As with the In Block, it is better to increase difficulty by changing bands, as the tension Downward is the enemy to proper performance of the block. 7) Down or Low Block : For this exercise, you start with your blocking hand near the opposite shoulder, palm inward, with the resistance band wrapped around the outside of the Non-blocking shoulder, across your back, around your front and secured by the non-blocking hand as shown.. The band should be under tension as before. Grip the handle as before, as if it were a knife. Perform the block by bringing your blocking hand downward across the front of your body as shown above. The back of your hand stays facing outward until right before impact, when you rotate and extend your arm. 8) Knife Hand : For this exercise, you start with the resistance band wrapped as before, around the outside of the opposite shoulder as in the photograph, secured by wrapping it around your back and under your active arm, and being secured by the other hand. You hold the handle from the top, with your thumb. 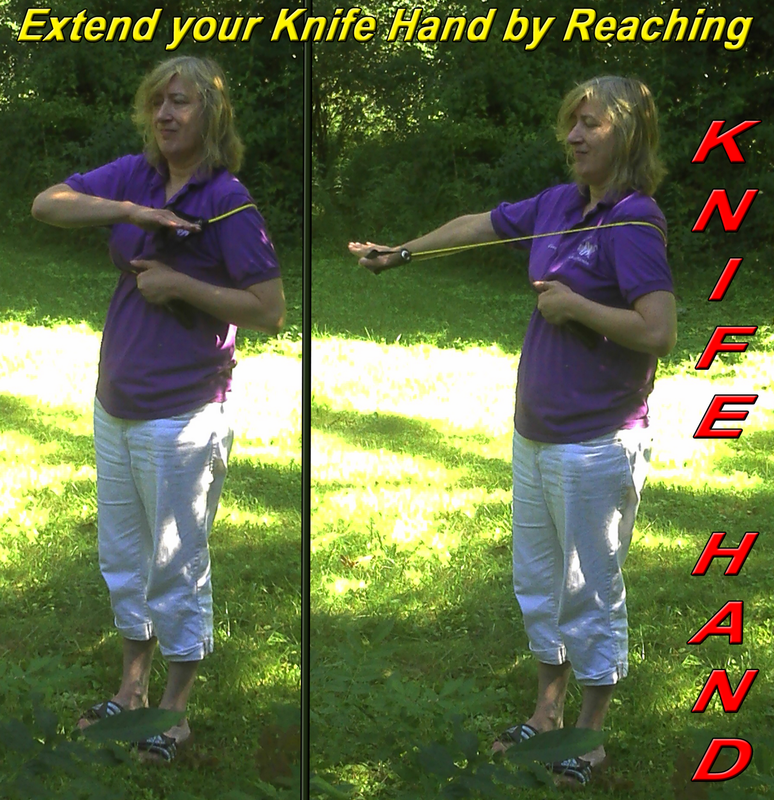 We perform the exercise as a knife hand, with the palm open, but you can just as easily perform it as a side hammer fist, though more of your forearm is used, and less of your shoulder. 9) Ridge Hand : For this exercise, your start with the resistance band wrapped as before, around the outside of the opposite shoulder as in the knife hand exercise above, only your hand is palm up, and the hitting surface, if you were hitting, would be the inner edge of you pointing finger, down the outside of your thumb. This exercise starts with the palm facing the opposite shoulder, as in the low block, but the hand is open. You extend your arm across your body to the front as shown, rotating your palm upward just before impact, opening your shoulder and forcing your fingers as far forward as you can. Once again, you can increase either the starting tension or the band. 10) Back Fist : For this exercise, you start with the resistance band wrapped as before, around the outside of the opposite shoulder as in the knife hand exercise above, only your hand is gripping the handle as a ice pick as shown in the picture. To compete the punch, make sure you open your shoulder and extend you arm as far as you can at the point of impact. 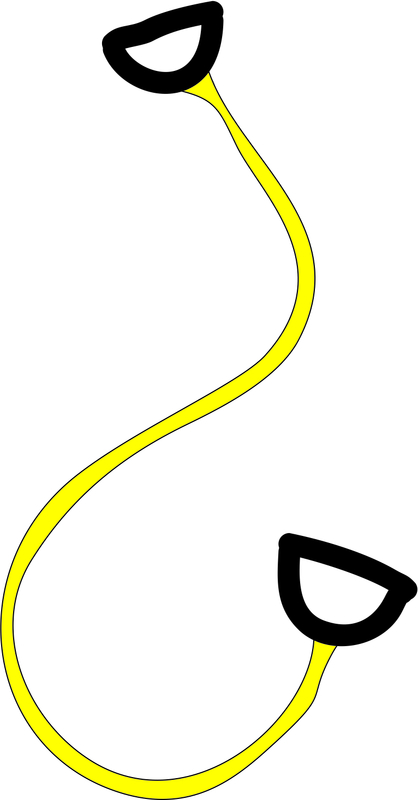 As before, you can increase the difficulty either by increasing the starting tension or changing resistance bands. Now, a word about motivation. Long ago I learned that most leaders have many reasons for doing something, but just 1 motivating passion that sustains their effort. Without that motivating passion, you will never do anything for very long. So first, get your passion, your reason, your motivation down. Once you do, begin. I have listed below several motivations that I have heard and seen, that have worked. They all work, if they describe you. Mine is last. 1) I want to live longer. 2) I want to be around for my family as long as I can be. 3) My (family member) died early or is out of shape, and I do not want to be like that. 5) In my job I need to be fit to get ahead. 6) Relationships work better if I am fit. 7) I am stopping smoking and I do not want to balloon up. 8) All my friends are doing it. 10) 1 Corinthians 6:19-20 (NIV): "Do you not know that your bodies are temples of the Holy Spirit, who is in you, whom you have received from God? You are not your own; you were bought at a price. Therefore honor God with your bodies." - It is really hard to honor this, if you do not exercise. This is my reason. It is NEVER to late. So find you passion, your reason, and then go. The roadblocks have been removed, live your life out loud.